Question 130. What does God require of preachers tempted to rely on technology? Answer: Ok, this was a provocative title, and technically Microsoft programmers were still in the early stages of development and they hadn’t yet released powerpoint in 1563. But the title may not be too far off. 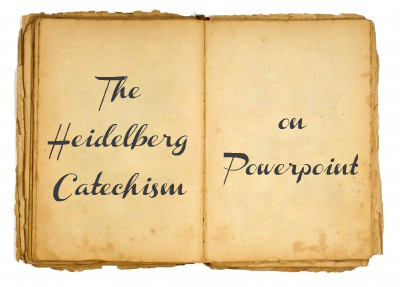 I was looking through the Heidelberg Catechism earlier this week in light of a discussion on some historical matters. Along with several other points that I really appreciated, I noticed one particularly relevant to preachers. Question 97 develops the issue of not making images of God with a broader question of the use of images in the church. Then comes question 98 . . . Question 98. But may not images be tolerated in the churches, as books to the laity? Answer: No, for we must not pretend to be wiser than God, who will have his people taught, not by dumb images, but by the lively preaching of his word. Quick thoughts . . .
2. Do we think people can’t be engaged and drawn in and captivated by the teaching of the Word of God? I won’t get started on attention spans or this will become a long post! 3. Do we do our best to be alive, life-giving and lively in our preaching? No generation has ever thrived under the dull preaching of God’s Word. ← Don’t Just Get the Idea! Do you use a microphone and PA when you preach? Do you use a Bible edited, typeset and printed using computers? Then you already “rely on technology”. Why would you single out PowerPoint as any different? Morally, it’s the same as all technology: it can be used by bad people to let them do worse things, or by good people to let them do better things. So long as we’re good people, I think it’s good to use any and all of the tools available to us. And let’s not forget that the Bible is full of picture language — one thing representing another. I think the Heidelberg catechism is just plain wrong on this one. Sorry Mike, maybe the post wasn’t clear. It wasn’t really about technology, but rather a reliance on images as an alternative to the effective and lively preaching of the Word. I presume you don’t mean we should replace preaching the Word with pictures of God in our churches? That was the point of the Heidelberg Catechism. I co-opted it to prompt thinking on the use of PowerPoint, which may or may not be helpful and appropriate in any given sermon. Heaven forefend! Preaching is about ideas (I’m sure I read that on a blog somewhere :-)), and to communicate ideas you need words. But I’ve often found that images are very, very helpful in backing those words up, and giving people a memorable hook to hang the ideas on. In short, although I hate the time-consuming process of constructing a PowerPoint to accompany my preaching, I’ve come to realise that it makes the sermon a lot more effective than it would be without. @Mike, what about for people like me who use PPT all day as part of my job and hate to see it again on Sunday? Oh, believe me, I hate PPT at least as much as you do 🙂 I resent the time it takes me to prepare the slide-sets that accompany my preaching. But it’s about doing the best job for the congregation. Bear in mind that comments after a sermon are not the way for any of us to evaluate effectiveness. People will say something to be polite, and if you did something with powerpoint, that might be the easiest thing to comment about. Just a thought. That is very true. But then it’s also true of all feedback. Doesn’t seem to say anything either way about the value of illustrative visuals. I’m still strugging to understand why you would think that illustrative stories are useful but illustrative images are not. You’ve overstated my view. I am not opposed to illustrative images and have used them at times. I am willing to critique the notion that simply having illustrative images makes a presentation stronger. I haven’t seen powerpoint and similar used effectively anywhere near as much as the received popular opinion suggests it is. When it is done well, it can help. When it isn’t, it can really undermine.